Wise people and societies do not trade long-term benefits for immediate gratification nor the lessons of the past for the impulses of today. We are all part of an immensely ancient and still unfolding learning adventure, alive in this moment. So help all people and groups play their evolutionary roles consciously and responsibly for future generations and the Earth. What are the roots of what we’re experiencing now, and where does it seem like it is headed? What important past and future energies are present in and around us right now? How might we best engage with them? What can we learn from the ancestors? From future generations? How will this option we’re considering affect the Seventh Generation after us? What kind of ancestors do we want to be? What does it mean that we are evolution becoming conscious of itself? How can we help people, groups, and institutions play their evolutionary roles more consciously and responsibly for future generations and the Earth? “Deep time” refers to sensing deeply into the past, present and future. The deep past refers to our 14 billion year evolutionary history as science describes it. It also refers to being aware, respectful, and appreciative of our ancestors and learning from them. It also refers to our history, considered deeply – not just “this country went to war with that country”, but history as lived by ordinary people, history that clarifies their quality of life, their experiences and relationships, and history as lessons for what we can do to avoid damage and enhance quality of life now and in the future. History is filled with lessons like that. Deep time understanding offers us deep and meaningful connections to our past. Deep time awareness includes not being ahistorical, not thinking that everything important is what is happening now or that everything started when we were born. It is about sensing into what happened earlier, not just as history books with little connection to now, but as a lived reality. We are in the midst of a lived reality shaped by the lived reality that came before us. The deep present is being fully present in the “here-and-now”, seeing clearly what’s going on now. It includes the future that exists in this now-ness – the possibilities, the tendencies and trends, the things we envision and long for. And this deep present can extend backwards and forwards in time, since all of time is embedded in the Now, as long as it is clearly sensed and seen in the Now. The deep future we live in can extend over many generations or even to recognizing that our planet will one day be absorbed by the sun and turned to a crisp and disappear. 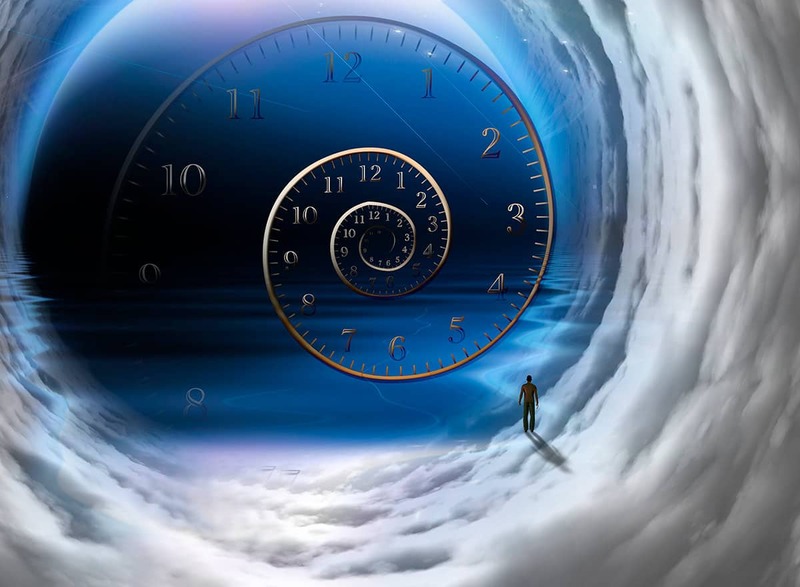 Being fully present in deep time means taking our place in that unfolding time track. Deep time is both an idea which puts our lives in perspective and a source of tremendous meaning, learning and guidance. It’s not just a mental model. Today is an essential part of deep time, but by itself – in just its most immediate forms – it is too narrow. Likewise, our self-interest is an important part of the larger needs of the world and of our community. But to narrow everything down to our self-interest is destructive, and to narrow everything down to what’s going on today and what I want today is likewise destructive. We need to put our immediate needs and realities in their place, in the context of larger vistas of time, space and systems. Our stewardship is for the whole of deep time and for all of life, not just for us now. Most people understand that current impulsiveness can endanger us, driving us to do things that will damage ourselves or others. Failure to think of the future, failure to ground ourselves in what we’ve been taught in the past that is potential guidance, virtually guarantees folly. Learning from the experiences of life is important. Immediate gratification and impulsiveness are not characteristics of wisdom. Our task is to apply these understandings to our own lives, to our communal lives and social structures, and to ask ourselves how we might create systems that embody this kind of stewardship of life for long-term benefit. Because we seek long-term benefits as part of our working definition of wisdom in this pattern language. I find it particularly useful, in this regard, to hold evolution as a 14 billion year learning adventure. Even before there were humans, learning was being done by other organisms, by natural systems, even by physical laws. There are scientists today that are talking about the evolution of physical laws. At the beginning, in the first few seconds of the Big Bang, nothing remotely like today’s physical laws existed. We have a lot of physical laws that have been emerging over billions of years. The structure of the universe has been shifting and things that were not possible or likely have become more solid and real. There are ways of interacting and being in the universe which are always coming about and generating their own influence on everything else. This sense of learning accelerates with life, with human consciousness and culture, and with new technologies. All that makes learning go faster and faster. So we are part of that process of evolutionary learning becoming conscious, albeit in some weird and broken ways. There is, of course, a lot of unconscious evolution happening in our societies and in our cells. But conscious choice is a relatively new phenomenon – particularly informed conscious choice, the kinds of information we can get by seeing beyond our immediate senses. Certain shamanic practices provide such capacity in ways that are not physical. Western cultures have developed physical ways and tools to see beyond our biological senses, probing deeply into realms of space, time, scale and complexity that we don’t normally perceive individually. So we are learning how to learn in new ways and we’re learning how to be conscious in new ways. The indigenous people who drove the megafauna – the large animals of North America – into extinction didn’t know they were driving them into extinction. They just knew that these animals were getting rarer and rarer, until they couldn’t find any more of them. But they didn’t know what the process was that was going on. But we with our sciences do know. We are very conscious that we are driving species into extinction. Once we are given that consciousness, we have a choice. Do we want to change the behaviors that are driving these species into extinction or do we want to just keep on going as we are? The fact is that our human choices are now a growing part of what evolution is about, at least on this planet. There is a decision or choice here – we might say a “meta-choice” – to make more conscious choices. We get to make that choice as individuals, and we get to make it as societies, as communities and organizations. All of that is a learning adventure, and the more we choose to be aware and to take action based on such awareness, the more we manifest a new form of learning. And that learning is what wise democracy calls for – individually, culturally and institutionally. We want to set things up so that we are increasingly capable of choosing consciously and responsibly, playing our evolutionary roles consciously and responsibly with an eye towards future generations and the welfare of the earth that those future generations will be living in, as well as current generations with respect to previous generations and what they have given us, and how their energies can align with ours. This is living in a deep time and not just in a very narrow sense of time. It is stewarding what unfolds in that deep time. That is what this pattern is all about. Buddhist scholar and systems thinker Joanna Macy has a number of practices to help people become aware of their place in deep time – both lineage and context – and also of becoming responsible stewards and agents within that deep time. The Native American idea that we should always guide our decisions by what we believe will benefit the seventh generation after us, which is an extension of acting for our children. I have understood the seventh generation concept as a deep time concept. One living individual has the memory of his or her great-grandparents and s/he is seeing in front of them their great-grandchildren. That is three generations before and three generations after – plus the person knowing those generations – so one person’s living experience can embrace seven generations. There are probably exceptions when somebody lives a very long life. Usually somebody has been around and had children and they have their own children. So seventh generation consciousness itself is a deep time past-present-future concept. Michael Dowd and Connie Barlow talk about and promote what they call The Great Story of Evolution. This is called Big History in more academic circles. It covers the meaningful, science-based story of life from the Big Bang until now, continuing on into the future. They have this story symbolized in a set of beads, sort of like prayer beads or rosaries. Each bead represents some major event in the history of the universe, the history of the planet and of humanity. They even say you have options to add beads representing your own personal history, both the one of your family and the history of yourself personally. So you can carry and embody something that represents deep time consciousness. Scenario work is exploring possible futures. It is covered in a different pattern. I wrote a book “Reflections on Evolutionary Activism”. A lot of it is what I said in the description of this pattern. Evolutionary activism is becoming aware of one’s role and identity as the evolutionary process. It involves conscious choice in the sense that we are evolving ourselves, we are evolving our cultures, we are evolving our social systems, we are agents of mutation, creating new forms and selecting, picking and prioritizing new forms. Darwin’s theory can apply here, in the sense that the dynamics of natural variation and natural selection are now becoming conscious. And to the extent we are becoming conscious change agents, we recognize evolution as the grandmama of our activism and change processes. Learning from that great Teacher of change and occupying every part of that change process in a conscious way, that is what evolutionary activism is about. Sustainability and regenerative cultures – these are whole movements looking at how our current behavior, current technology, and current economics play out over the future: How do they impact the resources, beauty, and survivability of our environment and for future generations. Shamanism is deep time consciousness applied. History: Again, the way most history is taught is not very useful for this purpose. Learning about the mega events of the explicit power centers, the rich people, the powerful countries, the big wars, the great inventions, these are all fine and good but they’re not giving us lessons for today, they are just giving us a particular story. We need history that looks at dynamics, that looks about how ordinary people’s lives were, how did civilizations collapse, what were the dynamics, how did civilizations grow and thrive, how did civilizations meet each other and do well or worse, how did human diversity play out over time? There is an organization called “Facing History and Ourselves” which is specifically about that, looking at cases of mass human destruction like the Holocaust and asking “Who were these people? What were they thinking? What were they feeling? How were they interacting? What generated this and what can we learn from it? How are we facing similar situations today? What horrors are we creating today for the future? How do we go about our daily lives just as they went about their daily lives? How can we wake up and make different choices?” This is a different way of looking at history. So teaching that kind of history is part of what serves deep time stewardship.